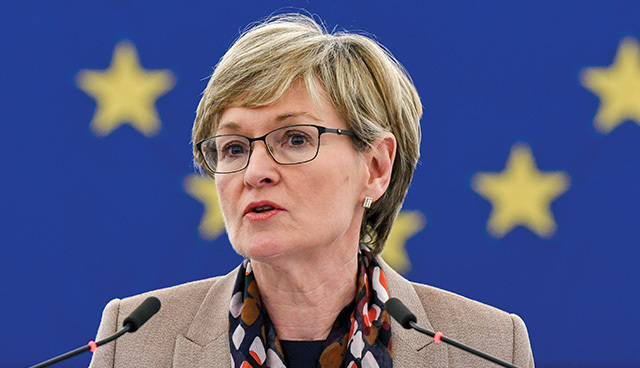 Writing for eolas Magazine, Fine Gael MEP Mairead McGuinness outlines her role as a vice-president of the European Parliament, the challenges of Brexit and ongoing work in committees. My political career was a long time in the making. I always had a huge interest in politics as a teenager and through my student days – that led me to journalism, a career which I enjoyed for over 20 years. The 2004 European elections were my first foray into politics and I was elected in the then East Constituency, and subsequently re-elected in 2009 and in 2014. In my first and second mandates I focused on Committee work: agriculture, rural development, the EU budget, environment, food safety and public health, and I also chaired a special committee of inquiry into practices in the financial sector. From 2013 to 2014, I served on the Bureau of the EPP Group. In 2014, I was elected Vice-President of the European Parliament and was assigned responsibility for the Parliament’s communications and information policy, as well as the Parliament’s scientific think tank. In January 2017, I was elected First Vice-President of the Parliament. The role involves working closely with the President, chairing plenary debates and votes, and meeting the many dignitaries who come to the Parliament. I have responsibility for relations with national parliaments, particularly with their European affairs committees. I also look after the Parliament’s dialogue with faith communities and non-confessional organisations, which is a requirement under the Treaties. Of course, Brexit is never far from the agenda of the Parliament and my own agenda – representing as I do a border constituency with Northern Ireland. British Prime Minister Theresa May’s most recent speech in Mansion House was positive, signalling a desire to remain close to the EU on regulations and EU agencies. But she maintained her red lines of leaving the single market and customs union. Following on from the European Parliament’s resolution on the future EU-UK relationship, the European Council has approved the guidelines for the next stage of negotiations. Both documents note that the EU wants as close a relationship as possible with the UK, subject to the restrictions that arise from the UK’s own red lines. The Council guidelines state that ‘frictions in trade’ will result from the UK’s red lines. ‘Frictionless trade’ is not possible when diverging from common rules and leaving the structures that decide on those rules. Within these constraints, we face the challenge of meeting our shared objective – how do we keep an invisible border on the island of Ireland? Our preferred option is to solve this through the overall UK-EU relationship. Alternatively, the UK will present solutions to the border issue. But if these do not work, the so-called ‘backstop option’ is crucial: full alignment for Northern Ireland with those areas of the single market and customs union that are necessary to keep the border open and maintain north-south cooperation. All our energies are focused on working within the EU to negotiate the best possible solution with the UK. There is a wider challenge for the Irish economy beyond the border and north-south cooperation. East-west relations are also key. This is the case particularly for our farmers and the agri-food industry, given the proportion of their trade with the UK and their all-island supply chains. They are already facing a more difficult time due to the collapse in the value of sterling. Our rural areas face a challenging time. Trade diversification to other markets is part of the answer – which will need EU and Government support. I will continue to keep Brexit top of my agenda as a member of the Constitutional Affairs Committee, which is responsible for ratifying the Withdrawal Agreement when it reaches the European Parliament. My work in my other committees continues. In the Agriculture Committee we have been looking at the future of the Common Agricultural Policy. The Commission has proposed a new system of delivery of the CAP, giving more flexibility to member states, although we have to be watchful that we don’t remove the ‘common’ part of the policy. The CAP budget is under pressure, not only from the shortfall resulting from Brexit, but also from the push to fund new priorities such as migration and security. In the Agriculture Committee we are adamant that the CAP budget must, at the very least, be maintained at its current level, if not increased. We will also be working on a new legislative proposal to combat unfair trading practices. I am pleased to see that the Commission has finally recognised that the place of farmers must be protected if we want sustainable food production systems. This is an issue that I have been working on throughout my political career. Protecting our farmers in terms of their health and wellbeing is another of my priorities. I have submitted an oral question to be discussed at an upcoming plenary session of the European Parliament, which asks the Commission how it intends to tackle the unacceptably high level of accidents and fatalities on EU farms. Sustainability continues to be a big issue. In the Environment Committee we have been looking at plastics, following on from the Commission’s Plastics Strategy which aims to reduce the amount of plastics in our landfills and in our oceans. But plastics also play an important role in our economy, such as prolonging the shelf-life of food, so there is an important balance to be found. We are aiming to ensure that all plastics in use can be reused or recycled. We have a new special committee in the Parliament that will be looking at pesticides and the EU’s approval process, following on from the controversy about Round-Up and similar chemicals. We want to ensure that only the safest and most effective agrochemicals are on the market for the benefit of our farmers and consumers. Perhaps one of the only positive effects of Brexit is that citizens in all member states are gaining a greater understanding of how the EU works and why it exists in the form that it does. Leading on from that we are also debating what sort of EU we want for the future. My colleague Helen McEntee TD, the Minister for European Affairs, has been hosting a series of regional citizens’ dialogues to consult with people around the country about the future. At these dialogues, education is high on the list of priorities – how we give our citizens the skills and languages they need for an ever-changing world. We have to ensure the stability of the Eurozone, so that we do not return to the economic crisis. Will we have a more ‘Social Europe’ – looking beyond economic governance to social issues – or is this an area best left to individual member states? How do we ensure the environmental sustainability of our economic growth? And how do we maintain the security of our citizens? Above all else, support for the EU is strong among Irish people. Our shared objective must be to ensure that, post-Brexit, the EU27 are united and strong, and face the need to reform the EU to make it fit for the many challenges ahead.